World Aids Day – Dim out Digital World! Don’t forget to dim our digital world tomorrow to show our support for World Aids Day. Massive Cutbacks Coming to New York State Higher Education! My colleague, Jack Hammond (Hunter College), passed along the URL for an article that appeared in Crain’s New York. The article describes the cutbacks that have started at SUNY and CUNY. For SUNY, it has already led to recommendations to close departments and retrench tenured faculty. At CUNY, the cutbacks have resulted in a hiring freeze and increases in tuition. For the coming year, it is likely that the bulk of the funding shortfalls will be borne by the students via tuition increases. In the UK, there have been protests some of which have led to violence. Here in New York State, we are awaiting Governor-Elect Cuomo’s plan for closing the budget gap and what it means for CUNY and SUNY. Without a doubt, it is going to be a difficult fiscal situation for public higher education for the next several years. Give Thanks and Pray for Our Future! Frank Rich and Tom Friedman have important things to say in their columns in today’s NY Times. Frank Rich’s piece, Still the Best Congress Money Can Buy, is a blast at our legislative leaders who cater to the rich and powerful. His best comments refer to “the hijacking of the political system by anonymous special interests”. On this Thanksgiving weekend while we give thanks for our bounty, we might also take time to pray for our future. The NY Times is reporting that this coming Wednesday, December 1st, a number of celebrities will be sacrificing their digital lives in observance of World Aids Day. They will not communicate/participate on social networking sites such as Twitter or Facebook, etc. until donations to the World Aids Day fund reaches $1 million. Maybe we should also participate by letting our CUNY Academic Commons go blank for twenty-four hours. I have just finished reading What Technology Wants by Kevin Kelly. Those of us interested in broader issues such as technological determinism and technological pessimism will find it interesting. Kelly covers a lot of ground especially when establishing a relationship between technological development and biological evolution. He uses a term “technium” to refer to a larger technological entity that has driven technological development throughout millennia. In what is probably the most controversial aspect of Kelly’s thesis, he refers to the technium as a “living organism” that permeates the universe. Kelly is surely a technophile who sees much of what is good in technological development. I believe he is on fairly firm ground when discussing the evolution of technology and especially on how it has expanded humankind’s choices and options. Although interesting and provocative, I don’t accept his comparison of the technium to biological evolution. I think this is a reach that I am sure anthropologists and others can easily refute. In sum, if technology is your thing and especially if you see the “good” in its application, you will probably enjoy this book. 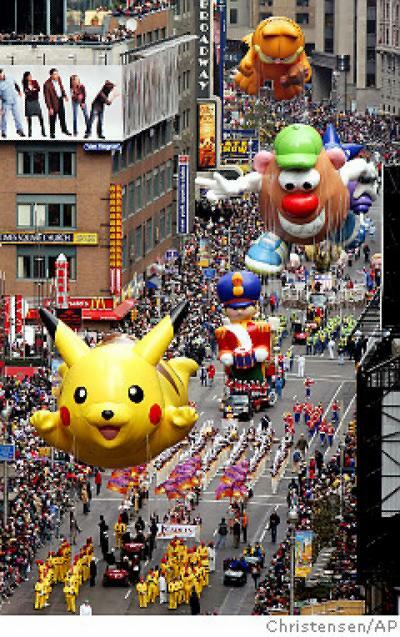 Happy Thanksgiving from New York City! Losing a New York Accent – Get Atta Here! Here is a quick, interesting and fun video featuring the actress Lauren LoGuidice who goes to a voice coach every week in an effort to eliminate her Queens (New York) accent. She tells of the need to change her voice and diction to sound more Upper Eastside in order to get the kinds of acting roles that she would like. She also comments on how her family especially her brothers (“You Talking to Me”) ask her: “What the hell you speaking?” Those of us growing up in Brooklyn, East Harlem and the South Bronx in the 1950s, know this story well. Young People – Wired for Distraction! American education at all levels is facing this issue. There is no simple answer. There has been a significant investment in instructional technology so it is not simply a case of educators ignoring the fact that many students are “wired” to online technology. After all, many adults including teachers also are engaged actively on the Internet. The problem is more whether young people are getting so “wired” to fast, multi-tasking environments that they are have difficulty concentrating deeply on an activity such as reading a substantive book. What seems clear to me is that while educators are increasingly using technology for instruction, they are not backing down from requiring students to explore topics in depth. Activities that require substantive reading, working out a difficult math problem, and critical thinking are significant components of the educational repertoire as well they should be. The solution to this issue likely centers on finding the right mix or integration of high-paced technology and slower-paced problem-solving activities. Young people as well as the older generation of educators are going to have to find the common ground. In sum, the article is humorous but also a sad commentary. Association of Public and Land-Grant Universities Annual Conference! Today is a travel day for me to Dallas to attend the Association of Public and Land-Grant Universities Annual Conference. I am part of a panel presentation entitled, For-Profit and Non-Profit Universities: Serving vs. Enrolling Under-Served Populations. (Monday afternoon, Reunion Ballroom C) If any members of our community are attending this conference, please stop by. Also take a look at Frank Rich’s column, Who will Stand Up to the Superrich? in today’s NY Times. He takes “big shots” at the “big shots”. He refers extensively to Jacob S. Hacker (Yale) and Paul Pierson (University of California, Berkeley) book, “Winner-Take-All Politics.” It is an indictment of the behavior of both parties in catering to the will of the superrich by maintaining grossly unfair tax policies. The best line in the column is taken from John Raese, who recently lost in a West Virginia senatorial bid and lime and steel magnate, who without apparent irony was quoted as saying, “I made my money the old-fashioned way — I inherited it.” Frank Rich goes on to write that America is heading into another Gilded Age.